Invite All Friends To Like Facebook Page: If you have Any Facebook Page, and want to send Invite to all of your friends, to like your Facebook page in Single Click without any kind of script, then this Tutorial is for you. Below, i have mentioned step by step guide, which you can follow for Send invite to all of your Facebook Friends in one click, to like your Facebook page for Increase the number of likes in your Facebook Page. 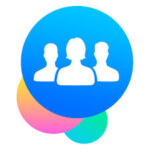 Last Time, We was shared method about How to Add All Friends in Facebook Group in one click, Now We are sharing about Inviting all friends to Facebook Page in one click. You can Also Call this method as How to Increase Page Likes, Because this Trick will increase total number of likes in your Page. It's Very simple, if you want to increase likes in your Facebook Page, then you have to Send Invite to all your friends to like your Page. 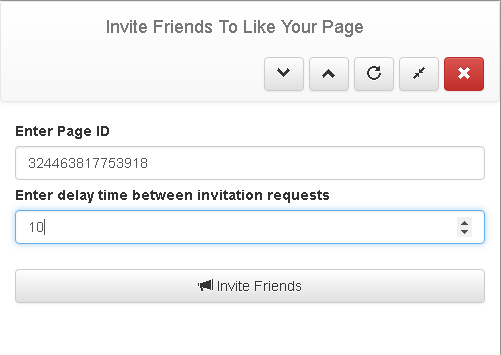 You can Easily use this invites all friend to like Facebook page for free, with the help of free chrome extension. If you send invite one by one to all your friends, then it will take a longer time. For example if you have 1000 friends in your friend list, then you can send Invite to like your Facebook page in one click, without doing any difficult tasks like Using Script etc. You can also say this invite all friends to Facebook event trick. 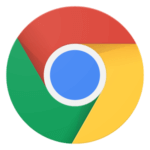 This method is based on Chrome Extension, which you can install in your PC, and use it easily. As from Title Explains, This Way of Sending Invite to like page to all friends in one click, is based on the Chrome Extension, which is the one of the safest method ever. If you are looking for easiest way ever, to increase number of likes in your Facebook Page, then you can Easily Follow This Tutorial. This Tool Name is Facebook Social Toolkit, Which you need to install in your Chrome Extension for use this Method. Have a look at Some Super cool features of this trick, then follow this step step by step for increase likes in your Facebook page. No Id Ban, Fully Safe to use. No Script Needed, Fully Working with just one Chrome Extension. Fastest Method to Invite all your friends in one click with interval between sending invite option for lower the risk of getting ban. Based on chrome Extension, No need of any kind of script. Safest Method ever for invite all your friends to Like one Facebook Page. Follow Below Step by step guide, for Send Invite All Friends To Like Facebook Page in just one click without any kind of script. At First, Install Facebook Social Toolkit Free Version from Chrome Webstore. 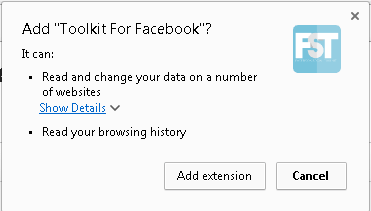 After Download Chrome Toolkit from above link, now It will ask you for add toolkit in your Chrome Browser, Now Click on Add Extension Button, Just Like Below Screenshot. After Successfully Install This Chrome Extension in your PC, now it will show you a new icon, in your Chrome Browser. Now Open Facebook from your Browser. As Soon your Open Facebook from your Chrome, Now Make Sure your Profile Language is set to English (US), you can change it from Settings. Now, Click on Facebook Social Toolkit Icon from your Chrome Browser, and Select option of Invite Friends to Like your Page, Like Below Picture. And Now It will Open a New Window, in which you need to Enter Facebook page ID, in which you want to add all your friends, page ID can be found in url of page like below demo. Enter Facebook Page URL, and then it will show you ID of your Facebook Page. After Enter Page ID, and Enter Delay Between Sending Requests. If you enter 60 here, it will wait 60 seconds and then send another invite. I recommend to use 10 seconds delay, it will fast up this process, but don't enter lower time delay like 1 second etc, it can put your FB ID in risk. And this tool will do his work, keep your Tab open while it send requests, an enjoy this method for send invite to your Facebook page from all your friends in one click. 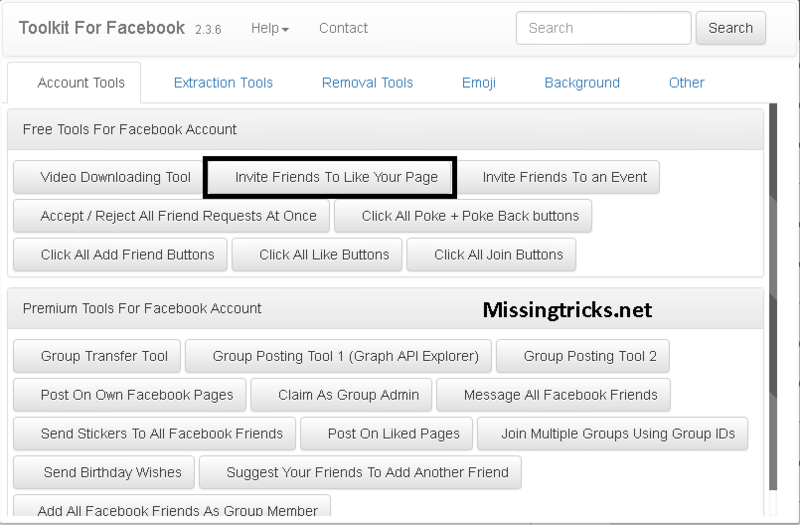 So Guys, this was the easiest way ever for send invite to all of your friends to like your Facebook Page in single click. I hope you will try this method, and found this trick helpful. We have tried lots of methods regarding sending invite to all friends to like facebook page, but we have found this Chrome Extension very helpful, which you can use easily in your PC with Google Chrome Browser. You can try this method once, and it will work like charm. If you have some issues while following this tutorial, then simply comment below. Please share this trick now from below sharing buttons. Thank you for visiting and i hope to see you again ! You use mgliker,djliker, myliker site.